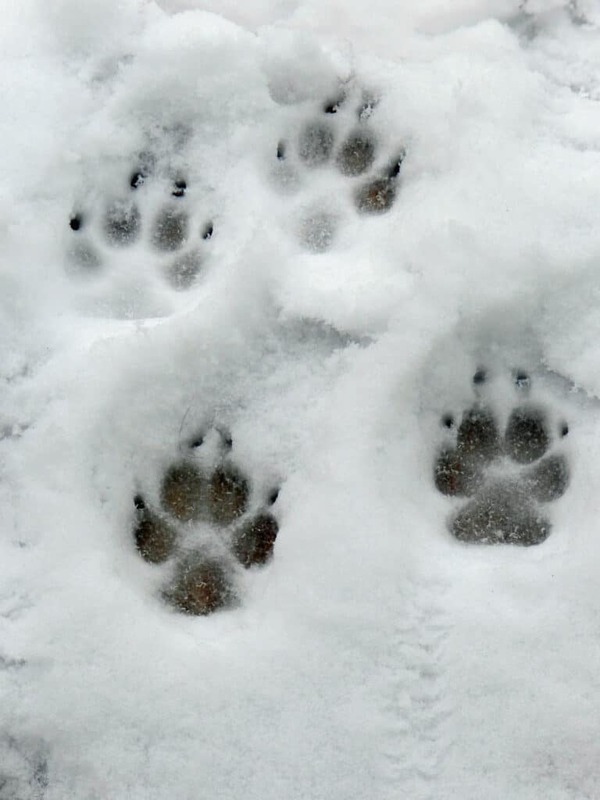 I woke up this morning, looked out the window, and everything is covered in snow…..AGAIN! I cannot wait until spring comes, and stays. 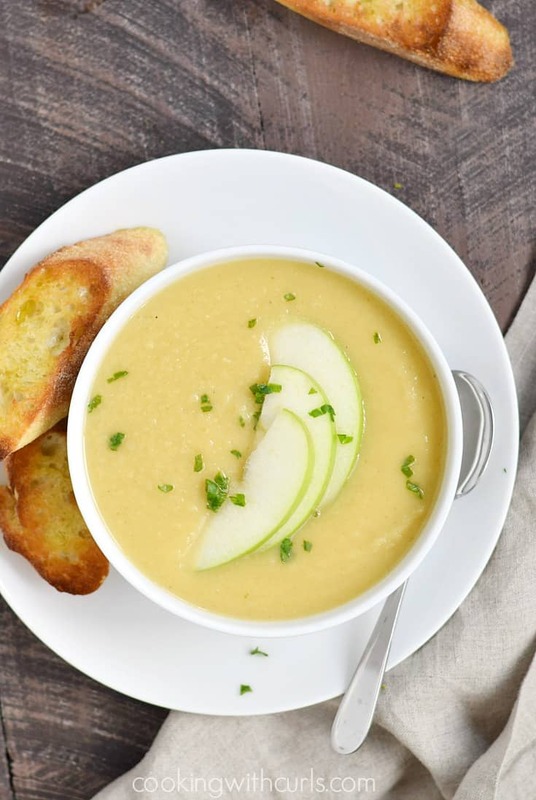 Until that happens, I will continue to find ways to stay warm, and this Creamy Parsnip and Apple Soup is a healthy and delicious way to do just that….. It has the texture of jicama, or feels kind of like a hard apple…more of a grainy texture than a carrot has. It also has a strange smell, almost like polyurethane. 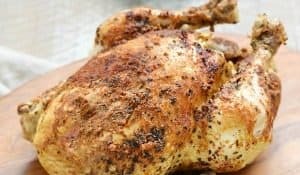 At least that’s what I thought my hands smelled like 🙂 Don’t worry about any of that, because when it is cooked, it has a sweet taste. 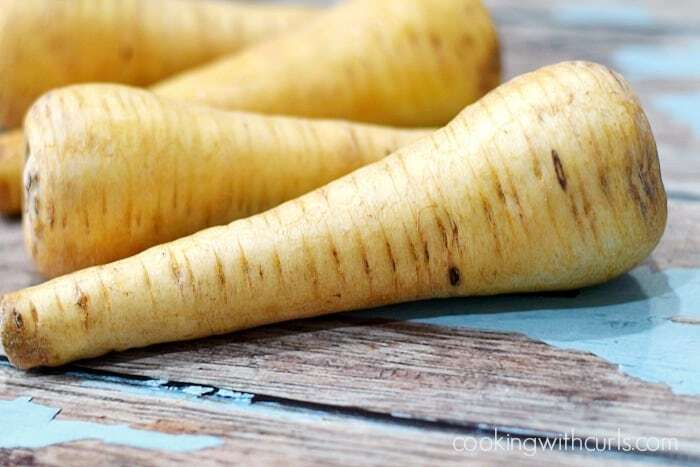 Parsnips are a staple in Irish cooking especially in soup recipes. They also have more vitamins, minerals, fiber, and potassium than carrots! Why do we not use these more here in the U.S.? 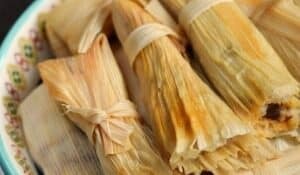 So far I have added them to mashed potatoes…..awesome flavor and it adds all of those extra vitamins, minerals and fiber! I have added them to several soups, works perfectly. 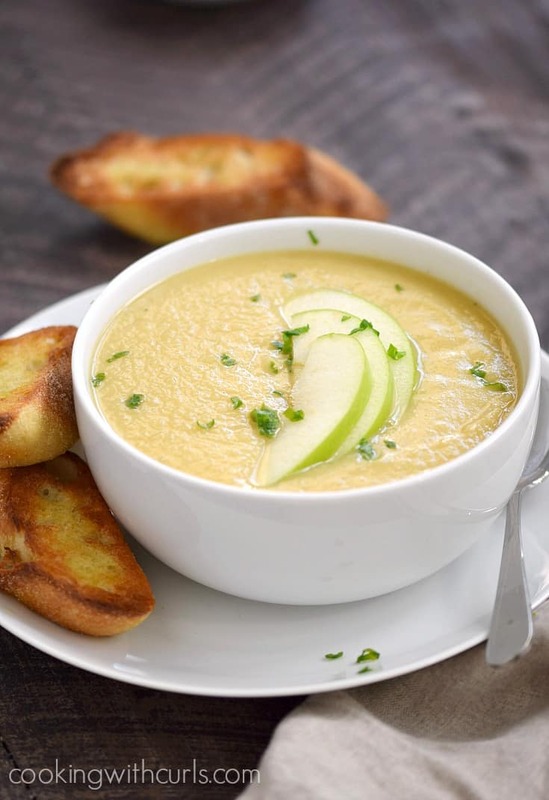 Now I need to add it to my pot roast…but first, let’s make some Creamy Parsnip and Apple Soup. Heat olive oil in a large Dutch oven over medium heat. 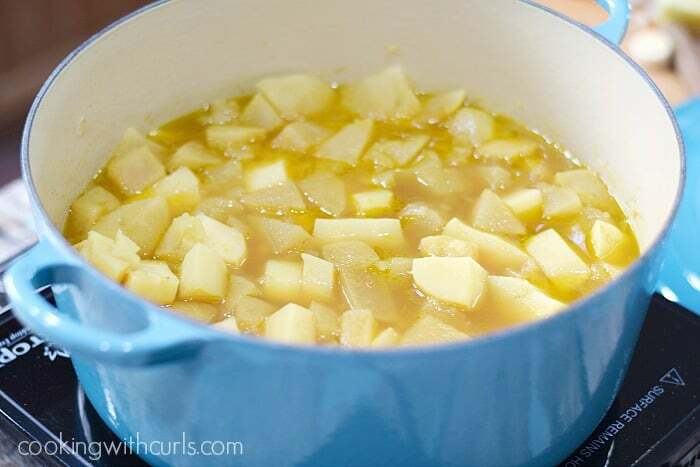 Add the onion and cook for 3 – 5 minutes, or until softened but not brown…..
Add the parsnips, apples, and potato and stir to combine…..
Cover the pan, reduce heat and cook until the apples begin to breakup, about 10 to 12 minutes, stirring occasionally. Add the broth, curry powder, cumin, coriander, salt, and pepper. 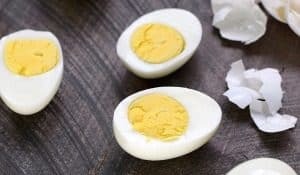 Bring to a boil…..
Place the cover back on the pan, reduce heat, and simmer for 35 – 40 minutes, or until the vegetables are tender…..
Puree soup using an immersion blender until smooth. Or pour into a blender in small batches and puree until smooth, and return to pan…..
Whisk in the Cashewmilk, and adjust seasonings if necessary. Preheat the broiler. Cut eight to ten 1/2″ slices from a baguette and drizzle with olive oil. Toast the slices on a foil lined pan, about 4″ from the heat, turning them so that both sides are lightly toasted. 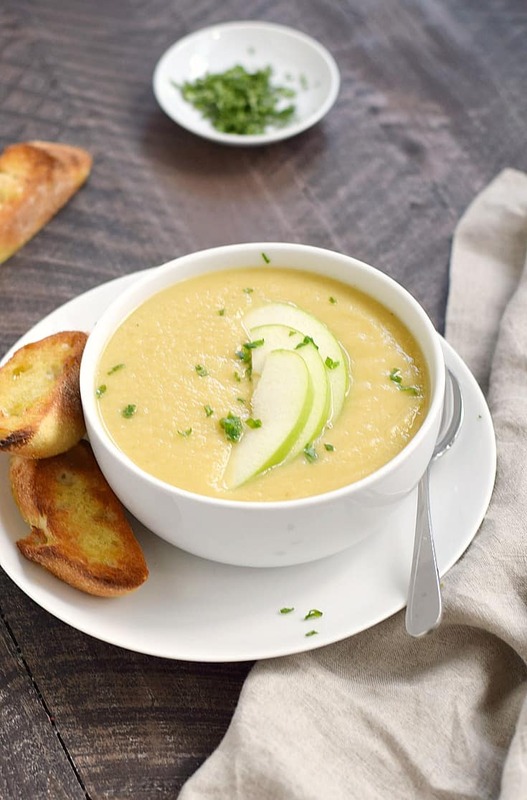 This Creamy Parsnip and Apple Soup is the perfect way to start an Irish meal, or serve as a healthy and delicious main course! Heat olive oil in a large Dutch oven over medium heat. Add the onion and cook for 3 - 5 minutes, or until softened but not brown. 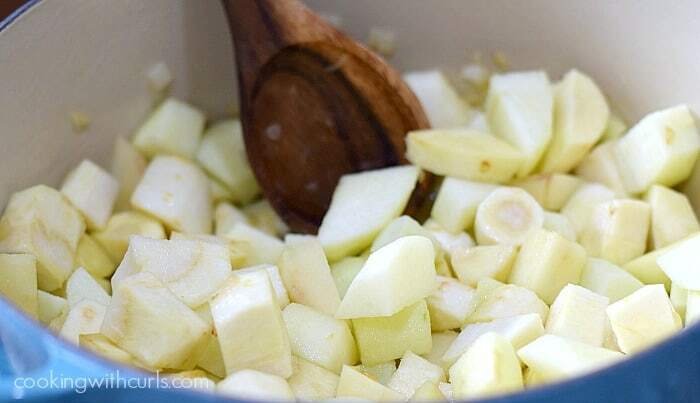 Add the parsnips, apples, and potato and stir to combine. 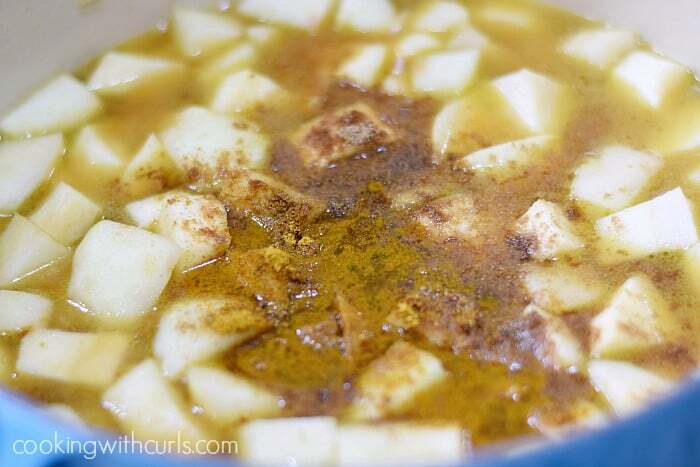 Add the broth, curry powder, cumin, coriander, salt, and pepper. Bring to a boil. Place the cover back on the pan, reduce heat, and simmer for 35 - 40 minutes, or until the vegetables are tender. Puree soup using an immersion blender until smooth. 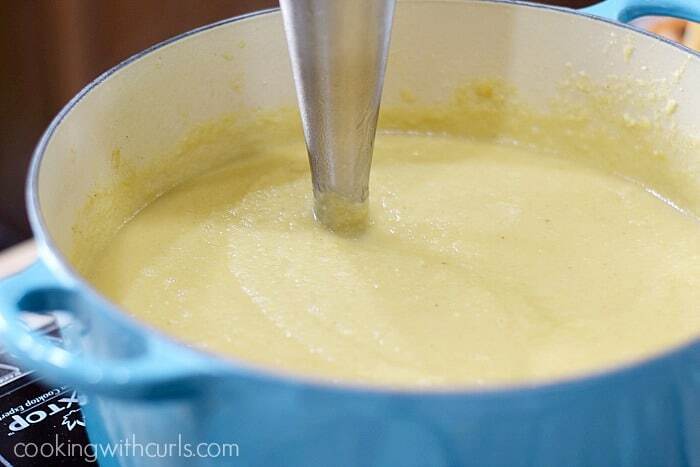 Or pour into a blender in small batches and puree until smooth, and return to pan. Whisk in the Cashewmilk, and adjust seasonings in necessary. 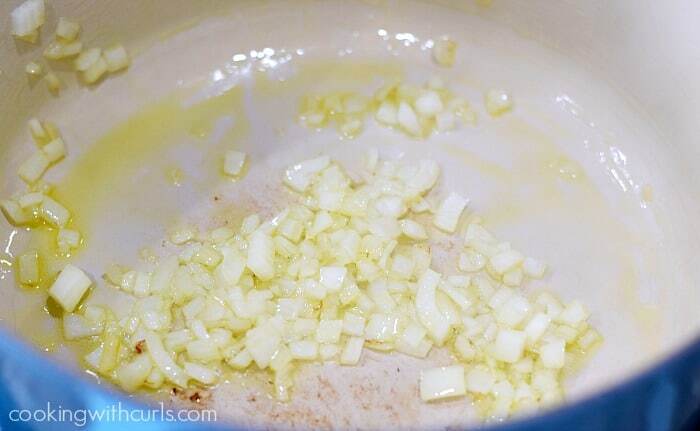 To serve, ladle the soup into shallow bowls, sprinkle with chives, and top with 2 Crustini, if desired. Preheat the broiler. Cut eight to ten 1/2" slices from a baguette and drizzle with olive oil. Toast the slices on a foil lined pan, about 4" from the heat, turning them so that both sides are lightly toasted. 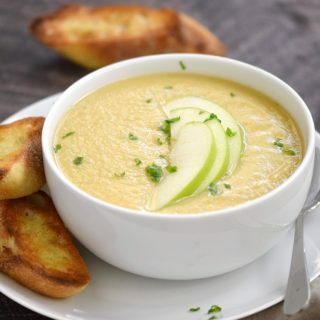 Any non-dairy milk will work, but almond or rice will make a very thin soup! Oh how I feel your pain girl! First day of spring tomorrow. Maybe the snow will all melt??? Lisa, this soup sounds SO good! I love parsnips, coconut milk, and all of the spices in it. I’m going to have to give this a try soon! Oh how I LOVE your blog! You’ve put such a fun twist on everything, it’s awesome! Lisa, I saw cheddar in the list of ingredients but nowhere does it show up in recipe. If not vegan, can I use cream instead of cashew milk or even almond milk, as it’s significantly cheaper? I am so sorry about the confusion Ty! When I first created the recipe I melted cheddar cheese on the crustini and forgot to remove the cheese from the ingredient list when I took the new pictures. 🙂 Yes, you can use cream, in fact it would be delicious. Almond milk may be a bit too thin, make sure to add it slowly to get the right consistency if you choose to use it.